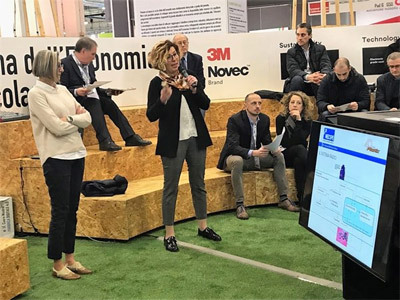 Recently, at the trade fair Mecspe in Parma, Italy (22 -24 March), RadiciGroup had the opportunity to present its experience in the area of sustainability during the series of meetings, Circular Economy Arena 4.0. On 23 March, during the morning session, “CIRCULAR ECONOMY: REAL PATHS TO SUSTAINABILITY”, Susanna Caprotti (RadiciGroup Performance Plastics) and Maria Teresa Betti (RadiciGroup Sustainable Communication) gave a presentation entitled “From jackets to automobiles: nylon’s certified path to sustainability”. The objective was to demonstrate how the use of ecodesign could reduce the environmental impact of a product – from the production processes and materials used to the end of life, including the potential recycling of the product itself. Two sustainability cases were brought to the attention of the engineers and technical professionals in the audience (who received free T-shirts made of RadiciGroup Radilon® nylon). The first case was an experimental pilot project, carried out by all the players in the Group production chain, to recycle wheel trim for reuse in automotive applications, while the second was a 100% nylon vest (fabric, lining, zipper, labels, snaps, etc.) that could be completely recycled at the end of its useful life through extrusion, so as to find a new use in the plastics industry. Additionally, in the Circular Economy Arena 4.0, during the session on 22 March dedicated to “NEW DEVELOPMENTS IN COMPOSITE MATERIALS”, Erico Spini, marketing & application development director Europe of RadiciGroup Performance Plastics, took the floor to discuss the Group’s experience in the use of recycled carbon fibre in the thermoplastics field. The goal of his presentation, entitled “Recycled carbon fibre for thermoplastics: opportunities and technical problems”, was to highlight the potential advantages and technological challenges to overcome in the use of recycled carbon fibre. By virtue of its high mechanical properties, carbon fibre can be used in metal replacement and, thanks to its low specific weight, is suitable for the lightweighting of parts. Moreover, by adding carbon fibre, possibly together with other additives, good thermal conductibility can be obtained without significantly compromising mechanical properties.